A downswing that started—well, months ago—continued tonight at Claudia’s PLO8 tournament. I went because I wanted to see if my travel partner David Long was there (he was, and regrettably, I was the player who busted him off the final table). I won this the last time I played it, but tonight I had to rebuy two hands in, after entering late. It was a little like a reunion of Portland Players Club regs, with Noah and Paul, and others at the two tables. The aforementioned downswing is not helping my plans to get myself out of poker jail by the end of the year. No four-figure cash since July, 20 straight losses in the Thousandaire Maker; it’s enough to put you off poker if you hadn’t already promised your wife you wouldn’t spend every night online or at a poker room. If you’ve been a fan of the WPT Bay 101 Shooting Star, you know it wasn’t held the past couple of years as Bay 101 built a new facility. It’s coming back this March, though, and you can win seats to the $5200 Main Event starting in less than two weeks! What a great Christmas present for yourself! 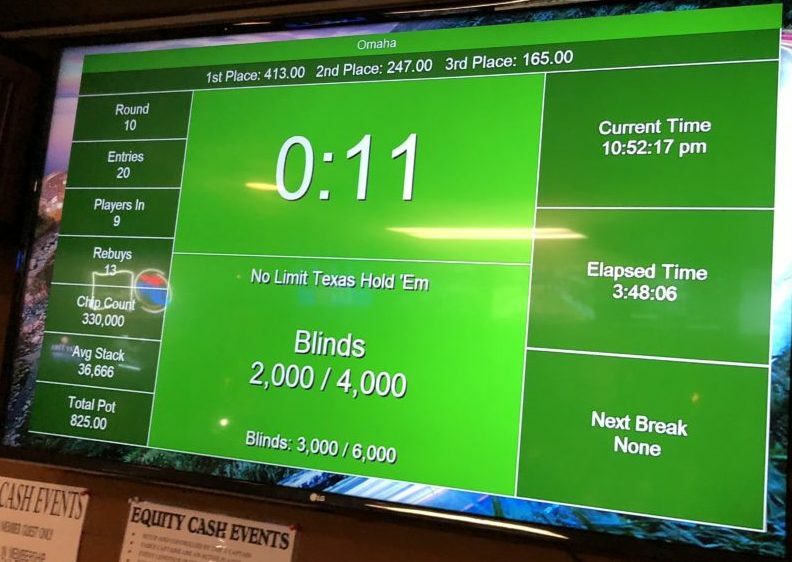 This entry was posted in General Poker, Pot Limit Omaha, Tournaments by Poker Mutant. Bookmark the permalink.